Hello bookish friends! It’s me Briar! I am here because today is our opening day for this year’s Virago Secret Santa. It’s a very lovely and clever thing where members of the LibraryThing Virago Modern Classics Group send each other presents all around the world, and nobody knows who will be giving them a lovely present until it arrives. We have been doing it for quite a few years now -since I was a young puppy – and it works very, very well. We sent our package off, back in November, and we waited to see what the postman brought. He brought a box, all the way from Pennsylvania, and Jane knew straight away who our Santa was. It was Laura! 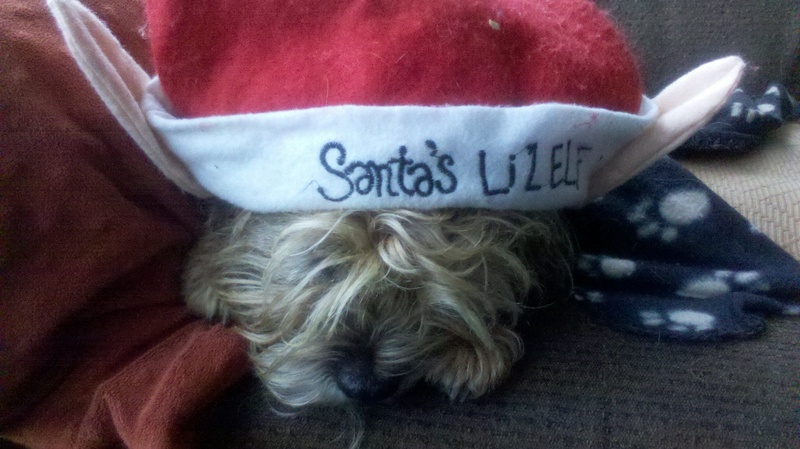 We were very pleased, because we like Laura; she has dogs and Jane was her Santa back in the very first year. The box said it was safe to open, and so Jane opened it and found a lot of things. There was a card in a red envelope. 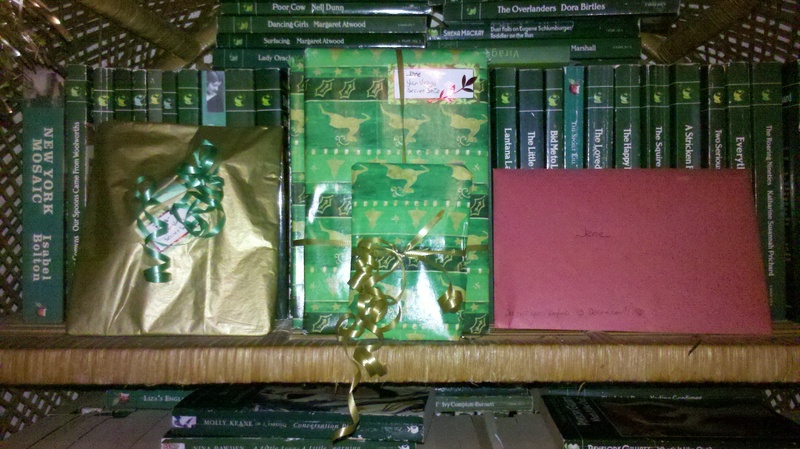 There were two green book-shaped packages. There was a little green package. And there was a little gold package addressed to me. I didn’t know I had a Secret Santa too. 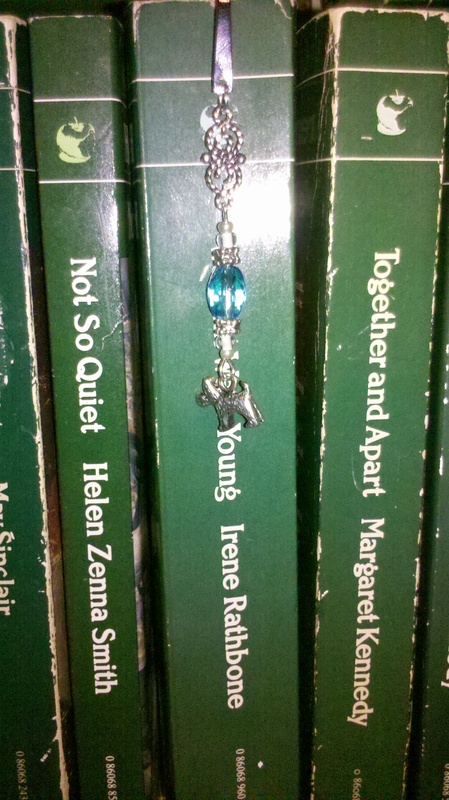 Jane put all of the things on the Virago bookcase for safekeeping. On the top shelf, which I can’t reach. The opening season begins on 19th December. We would have liked to open our presents on Christmas day, but as we will be having Christmas here and Christmas at Mother’s nursing home we thought we should do it today, so we have time to say thank you on the computer box. We opened my present first. 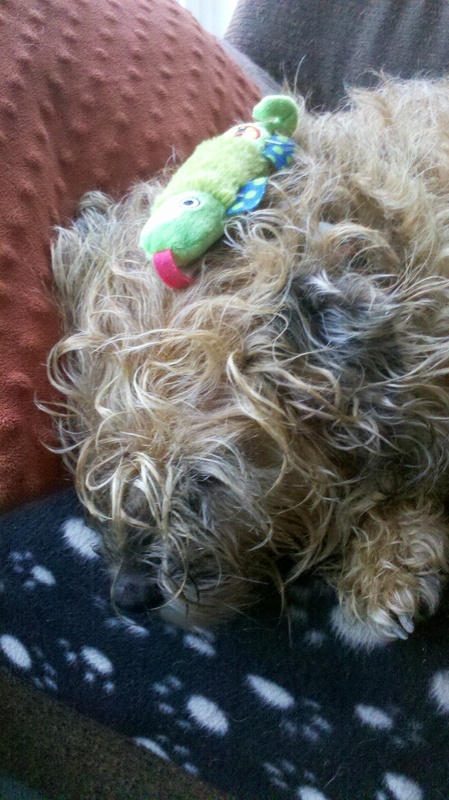 It was a little green lizard! I have never met a lizard before, but we have spent a little time getting to know each other and I think we are going to get along very well. Jane opened the little green package next. There was a very nice stitch-marker – Laura is a knitter like Jane – and there was a very nice bookmark with a terrier dog just like me. Jane put bookmark dog to work straight away. We were both very pleased, and we hadn’t even got to the books yet! Laura did very well with the books. 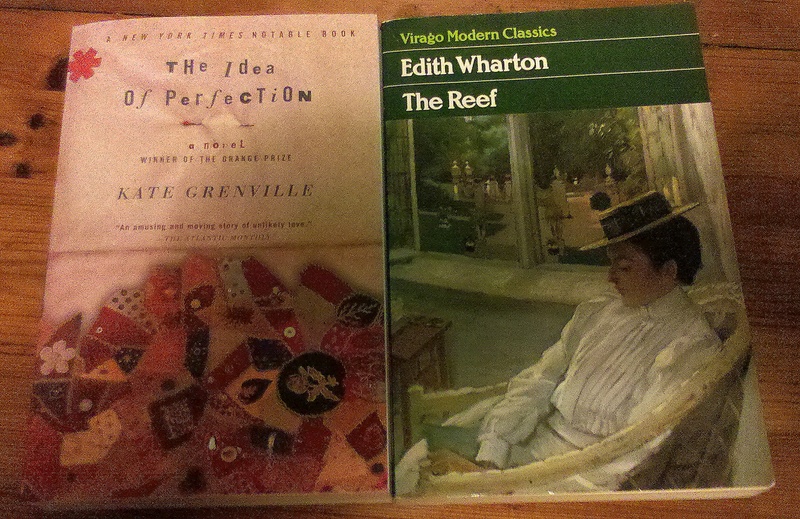 She sent a green Virago Modern Classic by one of Jane’s favourite authors that she didn’t have: The Reef by Edith Wharton. And she sent a book by an author Jane has heard a lot of praise for but never read: The Idea of Perfection by Kate Grenville. And now it is time for me to wish you all a very Merry Christmas and a wonderful New Year. And lots of lovely books – Jane told me to say that! Happy Christmas! As I’ve said on the LT group, I love that we often know who our gift is from before we open it, even though it’s a “secret Santa”, because that shows what a close-knit and lovely group we are! Lovely gifts Briar – and Jane’s been given some lovely books too. I have The Reef tbr and The Idea of Perfection I read some years ago I thought it was excellent. We are so glad you got a present as well, Briar. We think Jane will like The Idea of Perfection, we remember when it was read in our house that everyone thought it was excellent. Happy Christmas from The Bears. Happy Christmas Briar and Jane – what lovely things you’ve received and I hope you have a beautiful festive day! Happy Christmas to both of you. I hope Jane enjoys her new books – and how nice of Laura to send you a present too, Briar! Adding my wishes for a very happy Christmas! I’ve just recently joined Library Thing, so maybe I’ll get to play next year. Blessed Christmas to you both, and please wish Jane’s mum for me too, dear Briar. Thanks!